Buffalo hunters, railroad workers, drifters and soldiers scrapped and fought, leading to the shootings where men died "with their boots on". 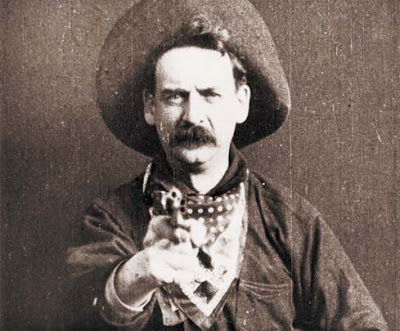 As time went on, the legends of the Old West grew to create a lasting impression on American culture, permanently embedding in the minds of many an attitude that lawlessness can never lastingly translate into perennial blissfulness. And so it was that fifty years ago, Johnny Cash released a song about life in the the American Wild West. Little did he know that his message would fitfully apply today, in a figurative sense, to new bloggers everywhere and their quest in understanding how to appropriately participate in the blogosphere. "Don't Take Your Guns To Town"
If you take your guns to town, you'll likely encounter trouble. If a dusty cowpoke at your side begins to laugh you down, you'll likely be forced to draw on him. No matter how quick and straight you think you can shoot, there's always somebody that's faster. Ironically and to the detriment of more than one young Billy Joe, when the West was wild there were no written rules governing behavior related to gunfighters. Nevertheless, certain rules did exist. But the only way to learn those rules was through experience. Trial and error. Relying on intuition, come what may. In considering our newly created Global Wild West, I can't help but wonder: Is that really how we want to force our teachers and students to learn? By relying on intuition, come what may? Or have we learned from the past, now enabled to provide a better way for those that follow in our footsteps? I understand that we're tired, and I understand that implementation could never be compulsory. But as I have come to answer this question for myself, my answer has been simple: There's got to be a better way! So with hopes of a better way in mind, I've set out to identify potentially problematic behaviors as they have been openly displayed throughout the blogosphere. I've then left the interpretation of such behaviors entirely up for discussion. At no time have I prescribed or condemned any type of blogging behavior. Rather, I have made a conscious effort NOT to, leaving it up to all of us to provide our thoughts, with hopes that in healthy discussion we can identify the kinds of etiquette we expect each other to follow. Again, it is my hope that in providing such a list of etiquette to new and interested bloggers everywhere - a non compulsory inventory of recommended guidelines, if you will - then they will be able to avoid some of the pitfalls that have plagued any number of Blogging Billy Joes up to this point in the short history of the blogosphere. If you would like to participate in the discussion, I welcome your contributions. Trial and error, come what may. Can't Find The Time To "Step Up"? Here Comes Everybody? Yeah, Whatever.